To verify if your child's age fits in the KICKSTART program - Click Here! To register for this program - Click Here! 4 year old Kickstart (2014) is full and no longer accepting kids for the spring 2019 season. 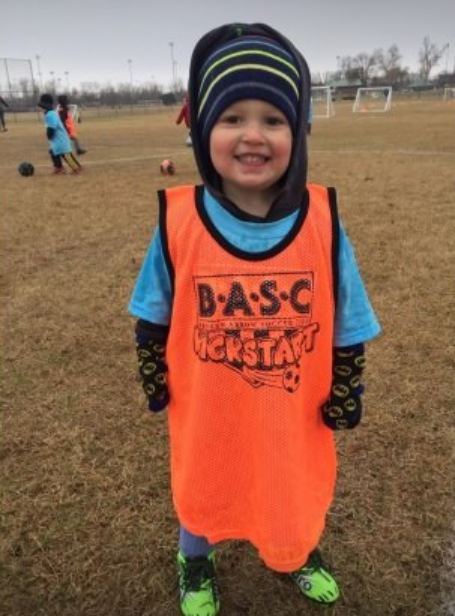 Broken Arrow Soccer Club’s KICKSTART Program is designed for the 3 and 4-year-old player and is focused on creating a fun and positive atmosphere to learn the world’s most popular sport of soccer. Children born in January & February 2016 are eligible for our 3-year old program. Children born in 2015 are eligible for our 3-year-old program. Children born in 2014 are eligible for our 4-year-old program. KICKSTART at BASC is run “academy style” with no teams. This is group training and New Ball games during sessions with similar skill level children. The program is comprised of eight, one hour sessions starting Saturday, March 2, 2019 for the Spring 2019 season. Program activities include dribbling, kicking, follow the leader, and many of other ways to get lots of touches on the ball. These are FUN and age appropriate activities kids enjoy without knowing they are working on soccer fundamentals. Parents are involved in 100% of the training sessions. This keeps the kids engaged, and helps the parents better understand how to help their son or daughter develop as a player. Don’t worry, sessions are only 1-hour, so you won’t get too worn out, as a parent-player. The KICKSTART 3-Year-Old Program is held on Saturday mornings. The KICKSTART 4-Year-Old Program is held on Saturday afternoons. The emphasis is on FUN, so the kids build a love of the game. Sessions are held at the best soccer complex in the state, Indian Springs Sports Complex. Each new player will receive a free BASC KICKSTART t-shirt. Parents will need to dress appropriately for moving around and participating. Parents willing to take on a little more and assist the KICKSTART Directors during the sessions are always welcome (plus you get a free t-shirt too). Please indicate on your registration notes that you want to assist. BASC will contact you about the time of your session at least 2 weeks prior to the seasons beginning in March (Spring soccer season) and September (Fall soccer season) of each calendar year. Kickstart 3: Week 1 - Toe Touch, Week 2 - Pull Back, Week 3 - Tick Tock Dribbling, Week 4 - Squeeze and Hop Week 5 - Roll - Ups & Downs, Week 6 - Blast Your Shot!